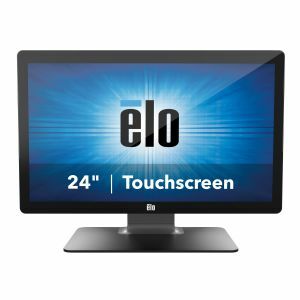 The Elo 2403LM 24-inch Medical Grade Touchscreen Monitor delivers a professional-grade interactive solution with Elo's industry-leading TouchPro PCAP technology featuring edge-to-edge glass and enabling up to 10 simultaneous touches. The clear glass touchscreen provides exceptional image clarity, resolution, and light transmission for vivid images and details. Available in either black or white, the feature rich touchscreen monitor is equipped with dual built-in speakers, VGA and HDMI video connectors. The 03-Series of Medical Grade Touchscreen Monitors are designed for healthcare with their compact form factor and clean design combine with IP54 certification and compliance with IEC60601-1 4th edition requirements.